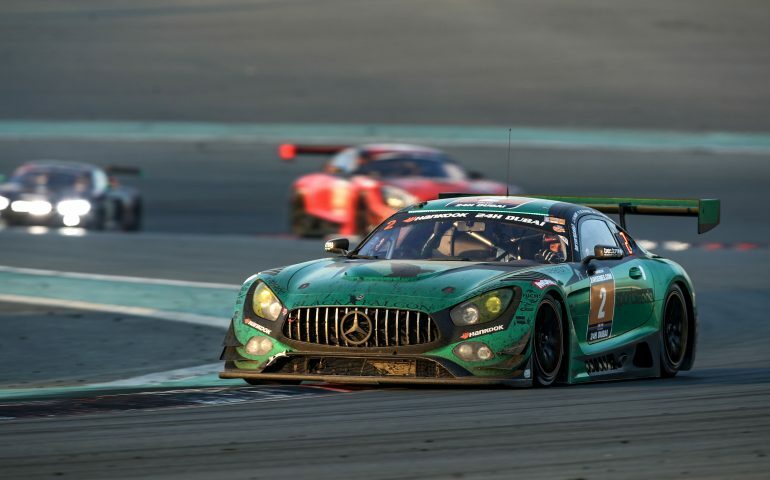 The Black Falcon Mercedes-AMG GT3 (#2, Abdulaziz Al Faisal / Hubert Haupt / Yelmer Buurman / Gabriele Piana) has won the 2018 24H DUBAI, the 13th running of the annual event that, at one point, had looked likely to be won by the sister #3 entry. Meanwhile, Liqui-Moly Bathurst 12 Hour representatives also tasted success; Matt Campbell winning the 991 Pro class, while Stephen Grove grabbed second in the 991 Am class victory in his similar Porsche entry. Grove will challenge for Class B victory in the 12-hour this February while Campbell will return to the Competition Motorsports Porsche that finished second last year. The SPS automotive performance Mercedes-AMG GT3 (#16, Valentin Pierburg / Tim Müller / Lance-David Arnold / Dominik Baumann) was the fastest A6-Am runner in 4th place overall, finishing just one lap ahead of the V8 Racing Chevrolet Corvette C6-ZR1 (#18, Luc Braams / Duncan Huisman / Alex van t’Hoff / Rick Abresch / Finlay Hutchison). The HTP Motorsport Mercedes-AMG GT3 (#25, Alexander Hrachowina / Indy Dontje / Bernd Schneider / Martin Konrad / Brice Bosi) had led the class until its fuel cap worked itself loose, coinciding with gearbox problems, but recovered to complete the A6-Am podium. Reigning Champions of the Continents Herberth Motorsport (#911, Daniel Allemann / Ralf Bohn / Robert Renauer / Alfred Renauer / Dennis Olsen) could do no better than 4th in-class thanks to power steering failure at an event the #911 Porsche 991 GT3 R won outright last year with Formula 1 Toro Rosso driver Brendon Hartley at the wheel. Phoenix Racing meanwhile secured a provisional GT4 1-2 finish with its pair of brand new Audi R8 LMS GTs, a strong result on the category’s 24H SERIES debut. The #248 entry (Philip Ellis / Joonas Lappalainen / Gosia Rdest / John-Louis Jasper) finished ahead of the #247 R8 LMS GT (Adderly Fong / Marchy Lee / Shaun Wei Fung Thong / Darryl O’Young / Charles Kwan) with both pulling away from BLACK FALCON Team TMD Friction Mercedes-AMG GT R SP-X (#264, Kevin Wing Kin Tse / Jonathan Hui / Antares Au / Frank Yu) throughout the night. The first ever endurance race for the McLaren 570S GT4 would come to an early end when the ALFAB Racing entry (#241, Erik Behrens / Daniel Ros / Fredrik Ros / Anders Lewin) would retire with turbocharger failure. The most high profile retirements of the 24H SERIES powered by Hankook season opener, however, involved a collision between the Black Falcon Mercedes-AMG GT3 (#3, Khaled Al Qubaisi / Jeroen Bleekemolen / Luca Stolz / Manuel Metzger) and the Mercedes of reigning Teams’ and A6 champions Hofor-Racing ) (#1, Michael Kroll / Chantal Kroll / Roland Eggimann / Kenneth Heyer / Christiaan Frankenhout). The Black Falcon Mercedes had led 198 laps until that point and looked set for victory but a collision under braking meant both would retire on the spot.